Biography: Heavenly Church of Pakistan in Karachi was established in 1980. It has grown to reach all over that nation. The church has 20 pastors and 12 evangelists that do the work of the ministry. There are several youth groups as well as women's groups. The ministry has a Bible college in Karachi and often works with other churches to expand the kingdom of God. 2. Outreach ministry so that many people come to accept Jesus as their personal savior. 3. Translate books to get and expand knowledge of the gospel. 4. Continued spiritual growth of children and adults. Strengths: Arshad and Shamim are gifted administrators. 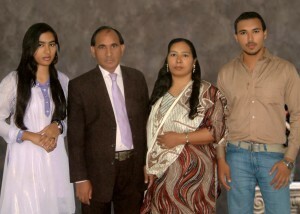 Family: Arshad and Shamim have two adult children, Stanley and Bunita.